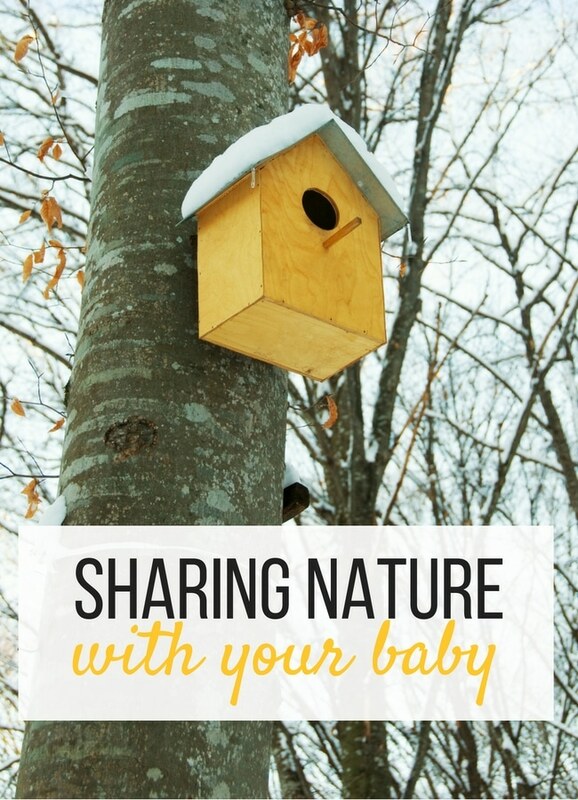 Having a new baby means finding new ways to explore nature activities to do with babies. It’s such an important role of a caregiver to explore your surroundings with them and build language around it. 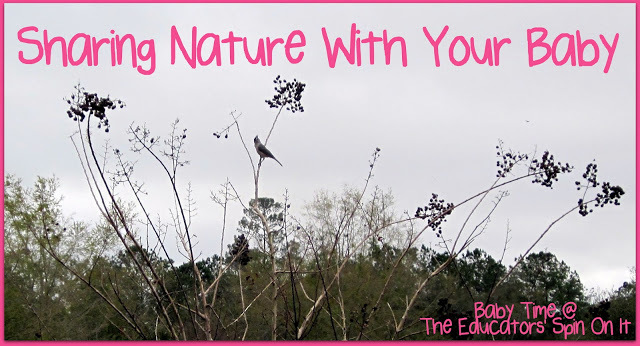 Here are six ideas exploring nature with your baby. It’s not what you think, I LOVE staying at home with my baby. 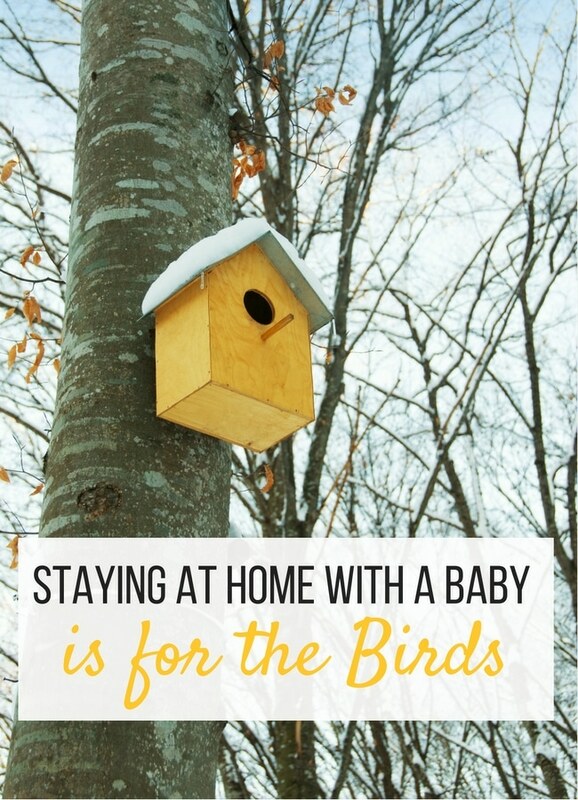 It’s that very statement “I’m staying at home for the birds” that is the underlying reason I am at home with my children each day instead of working outside of the home. I want to experience those everyday learning moments with her. Showing her all the elements of nature for the very first time. One of my daughter’s first signs was bird. Can you tell what we spend a lot of time doing? We spend some of our time going on adventures and seeing the world. I stay at home with my daughter so that I can share moments of her day talking with her about all the things she’s discovering in her environment. I love how babies get excited when they realize they are going outside for an adventure. When my middle child was fussy as a baby all you had to do was step outside for a moment and the whole world changed and she was calm… it was like magic. My youngest really enjoys dropping off big sister at school and watching all the big kids. We go on walks in the backyard, in the front yard, in the neighborhood, at the store, at the mall, at the duck pond, at the park, at the zoo, and even at the library. It’s my job as her Mom and as her primary caregiver during the day to SHOW her EVERYTHING and TALK to her about EVERYTHING she’s observing and experiencing both inside and outside. The photos above were taken this morning from our back porch with my daughter and I watching the brave birds and squirrels. We set out a bird feeder and bird bath outside our window too where she enjoys pulling up and standing at the window to watch the birds who come to visit our yard each day. She gets so excited to see the bird when they come. We like to sit on the back porch together and watch the birds come to the feeder too. 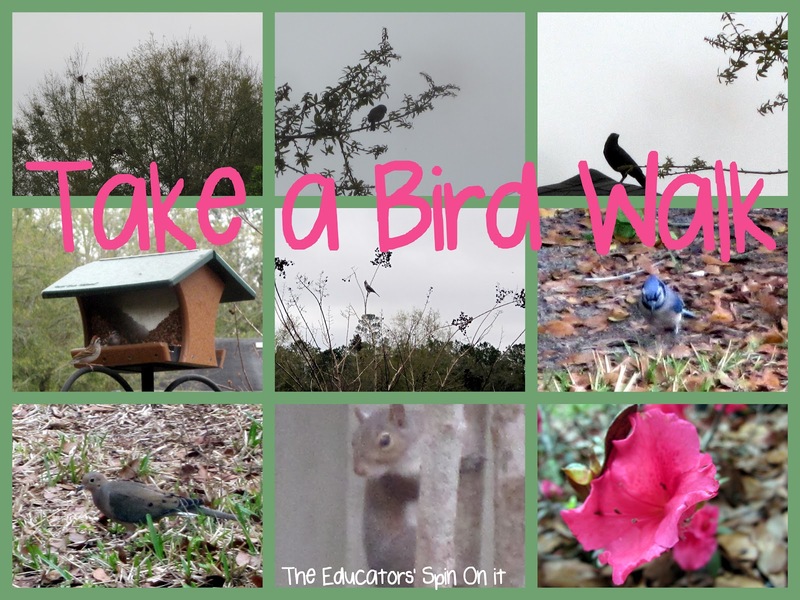 They are very brave birds and let us watch, even though we’re not the quietest bird watchers. The neighborhood crows like to come and land on our fireplace and Caw across they field, it’s very loud down the chimney. It’s so cute she stops whatever she’s doing tell me that the Birds are here. Of course it sounds more like buh buh buh when she tells me but because she also knows the sign for bird she uses that too. I encourage you to talk with your child using very detailed sentences about the things that your child is observing in their environment. I also encourage you to teach you child baby sign language, it is so much fun when they are able to sign things before they are able to say them and opens a whole new world of communication with your child. Use it when you’re singing songs, they love it! Signing Time Word of the Week: Bird This is our favorite Baby Sign Language Series. Here are both a video clip and an image of how to sign “bird”. To sign the word “bird” put your thumb and indes finger by your mouth, like a beak, and open it and few times. There a section for older kids too if you haven’t checked it out! If you missed it just remember next year in February! Here’s an adorable Bird Nest Craft from Tots Crafts to create with your toddlers and preschoolers as they join you on the walks from. You can take time with your older ones to Explore a Birds Next or even make your own Bird House by reusing containers . Go out and explore the outside with your baby! You can create a zoo within your own yard too. Click here to find out how. Make your walk a TALKING and DISCOVERING WALK! Take time and enjoy these moments with your baby, it’s why you’re at home with them. You can give them more than anyone else in the world at this stage in life. Go outside and enjoy the birds. I have experienced both sides of being a Parent both a Working Parent and Stay at Home Parent with my 3 children. They BOTH are equally IMPORTANT and rewarding. You are your child’s first teacher and you know which is best for them and your family’s budget. Thank you so much for stopping by our blog. Just discovered your site, love the counting on mat, I will be sharing this with my daughter and her after schooling that we do. Wishing you lots of luck as you transition to staying at home. I've been at home now for 6 years after teaching for 10. Can't wait to learn new things from you and share ideas with you. I love nature and getting children involved early on – yet again we're on a similar thread – We've spent the afternoon in the garden and I've been watching T explore nature, the texture of dried leaves left over from the winter, the pampas grass heads all soft and fluffy, listening to the bees buzzing (great huge bumble bees as well), she discovered she liked walking holding my hand on the stones at the side of our garden, but I think the best was when she brushed pass our herb pots and discovered the curry plant – she kept going backwards and forwards getting the smell. Cerys…It seems as they we are having very similar moments with our little ones yet so far apart from each other. I love your post about watching the lady bugs or should I say lady birds. Thanks for stopping by and sharing you afternoon. Can't wait to see what you do with the spring journal idea I shared. I added some words and ideas for younger ages just for T. Enjoy! That's interesting – my kids both really loved birds as babies (well, my son is still super into birds at 21 months). When we have lunch inside, he wants to sit next to the window to watch the birds. I so agree that being able to get outside with your kids often really is one of the greatest things about being a SAHM. Great post! This is such a lovely post! I think right now my sons word of the week is kitty cat, as that is what he says over and over when we go outside. Thank you for linking up to Baby Play Friday. Thanks Chrissy! Even my Kindergarten class one year got very excited about the Mother birds and nests all over the school campus once year, we couldn't wait for them to hatch. It made a really fun school science project to research what type they were and what their eggs looked like. It's fun to just live in the moment with our children! Thanks Krisin! "Hey kitty" was actually the first thing our daughter said if you can believe it. The sign for that is two hands so I think that's why she learned the sign for bird first. I think birds might be the first animal that babies discover once they've discovered their household pets. Thanks for hosting Baby Play Friday!